At this point you would have thought that the name Keys would have become a joke and people would simply have ignored him as a self publicising evangelist with scant respect for the truth. But Keys was nothing if not determined. 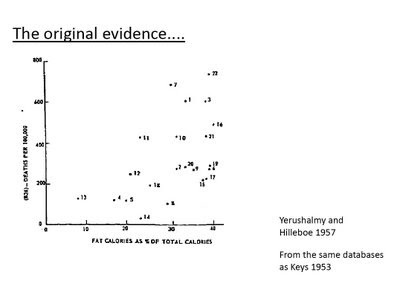 In 1958, the year after Yerushalmy and Hillebo had shown him to be a charlatan, out came this paper explaining the mechanism by which the high fat diet apparently caused heart disease, even if it didn't. 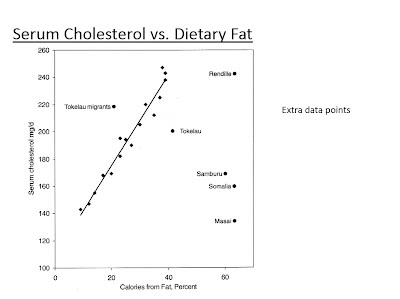 Serum total cholesterol!!!!!! 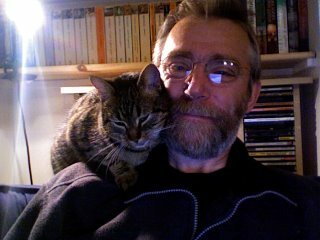 Picture credited to Dr Ravnskov (couldn't get the original). Anyone for a straight line? 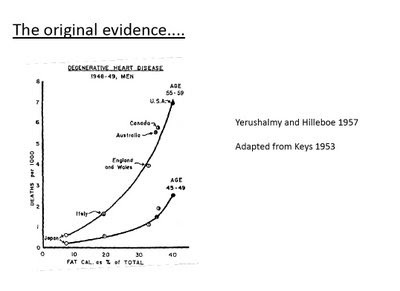 These studies are the core of the lipid hypothesis. They are where it all came from and the "science" is total junk. 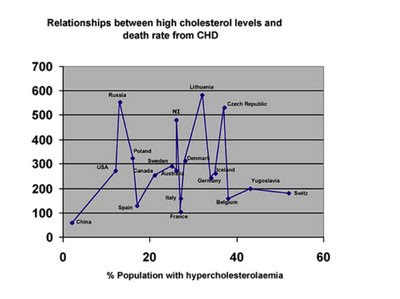 Obviously living in Russia, Northern Ireland, the Czech Republic or Lithuania is bad news for CHD. Forget cholesterol. That's as much as there was time for on between nations studies. Essentially they provide absolutely no support for dietary fat or serum total cholesterol as causes of coronary heart disease. 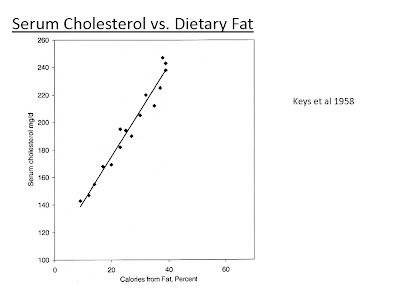 It seems impossible that they should have spawned the current climate of cholesterol psychosis, but they did. Within nations studies comes next. 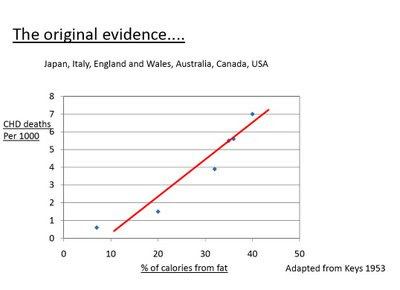 Hats off to Dr Briffa for this link. It's Willett of the weird PCOS diet again, but this one is useful. As far as I am aware sweetened drinks are not sweetened with glucose. It's sucrose or HFCS. Dare I use the F word? OK. Fructose. There. I said it again. You want a heart attack? F.
Just realised I never posted this recipe, the peanuts are distinctly neolithic but the flavour is yummie. Occasionally... It's on the top of the cooker now! 50-75g butter, depends on how fatty the meat is. About 200ml water, to just cover meat. Fresh root ginger, however much you like. Tablespoon vinegar or lemon juice. Place all ingredients in a casserole, bring to boil, stir well, cover, place in oven at gas mark four for 2-3 hours until meat melts in the mouth. Stir every half hour. Can be cooked very slowly on top of the cooker. Chris sent me a very interesting link a while ago and it just brought home to me how difficult it is to interpret a study in isolation. In fact, how random the world is in terms of what anyone does or doesn't know. Bacterial endotoxin is a breakdown product of the cell wall of gram negative bacteria. It's a lipopolysaccharide and even quite small amounts of it are extremely unpleasant. In overwhelming gram negative infections killing the bacteria releases endotoxin which can itself be fatal to the patient. Not killing the bacteria can have the same effect on mortality, so the best advice I can give is to avoid overwhelming infection. Now the scary thing is that eating a high fat meal, probably based on any fat which generates chylomicrons, markedly increases you uptake of endotoxin from your gut, which is obviously full of gram negative bacteria. 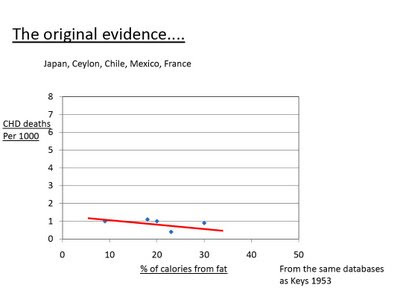 Eating short chain fatty acids or carbohydrate does not have this effect. OK, so the prediction from this research is that eating a diet which generates chylomicrons will produce all sorts of nasty changes in your body. Hmmmmm, well maybe, but I've not noticed. Then came a fascinating random paper through my wife's journal club meetings, which are a routine part of her PhD. It's about superinfection with resistant bacteria when broad spectrum antibiotics are used. This is a routine problem for anyone in medicine, especially patients. The concept is very simple, you kill off the susceptible commensal bacteria in the gut and resistant pathogens have no competition, so they have a field day and superinfection causes severe problems for the unlucky patient. It turns out that the immune system, that is the innate immune system (of course), continuously monitors the contents of the gut by looking at endotoxin production. Lots of bacteria mean lots of endotoxin and an active, on-guard innate immune system. Kill off 99% of your gut bacteria and exdotoxin production drops. The innate immune system goes on vacation and clostridium difficile gets in and wipes out your granny. Simple administration of oral endotoxin to the experimental mice stopped this effect completely. So yes, it looks like chylomicrons carry endotoxin. Phew. That's better than a clostridium difficile infection! Reminds me of Uffe Ravnskov's paper on the benefits of LDL cholesterol in gram negative septicaemia. Must dig it out for an airing. Here's another interesting anti fructose snippet. Slowly, slowly a tiny step at a time. The strange thing is that these people probably think it's the triglycerides that kill you. Probably their next step is to theorise that if they just had a drug to stop apples raising triglyceride levels you could eat that apple without raising your risk of a heart attack. But what if it's the fructose per se that is the problem and the trigs are just a marker of how much fructose you have eaten? The apple hates you for eating it and it will have its revenge. 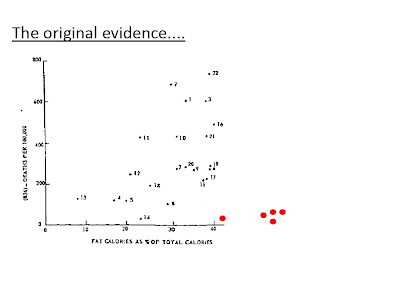 This video clip reminded me to put up the first few slides from the cholesterol skeptic presentation late last year. Squiggs is cooking scrambled eggs to feed to his toy rabbits, and to himself of course. It's Leonard Cohen in the background. I began the talk with a quick overview of cholesterol. How it was originally Bad, then it was subdivided in to Good and Bad. Then the Good became good Good and bad Good. 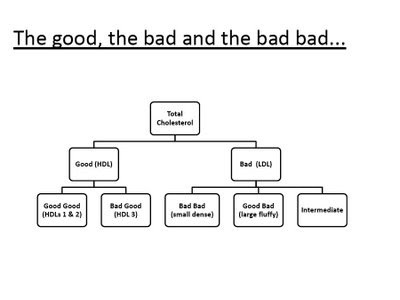 And the bad became bad Bad (small dense LDL) and good Bad (large fluffy LDL). Of course not forgetting IDL which can be good or bad depending on when it occurs! 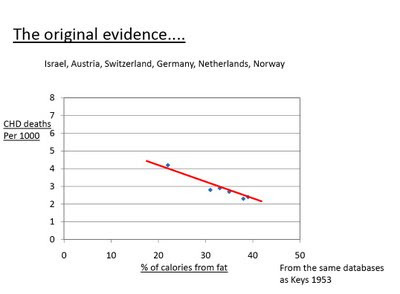 And triglycerides were Bad (big trigs) unless, of course, they were Good (small trigs). But the initial studies simply used total cholesterol to start the ball rolling, a measurement which is now generally considered irrelevant. The ball should have stayed still. 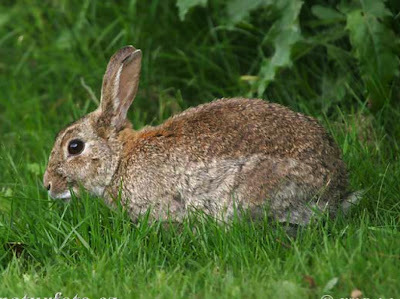 the fact that it is a fibre-vore which runs its metabolism on free fatty acids derived from cellulose fermentation in its hind gut, usually eating Timothy Grass as its sole food. 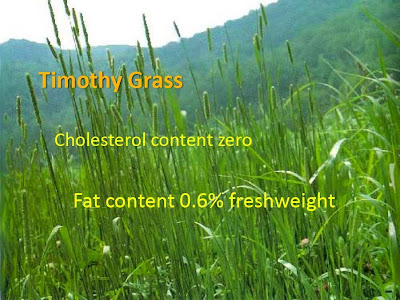 Timothy grass is 0.6% fat fresh weight and contains no cholesterol. 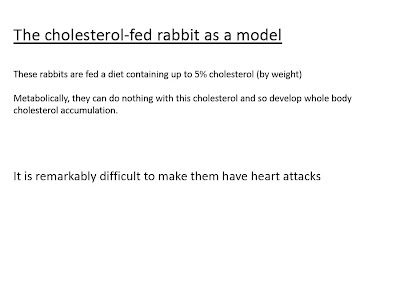 The lipid hypothesis was derived from feeding rabbits up to 5% of their food as chemical cholesterol dissolved in Wessen oil, which is mostly linoleic acid. 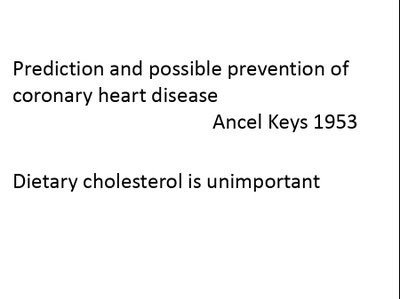 This even shocked Ancel Keys! 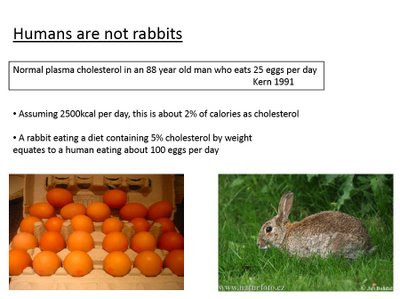 The final slide in this section was looking at the cholesterol fed rabbit in human terms, including the chap who ate 25 eggs per day for 13 years plus. Very reasonable cost but you will need guarenteed next day delivery or a courier, and time the sample appropriately too. EDIT: Ionised calcium 1.16mmol/l, normal range 1.12-1.37. No suggestion of hypercalcaemia. This post, like the first on MS, started with the conversation I had over lunch with Prof Ebringer and has been kicked around in my head for a few months afterwards. Here's the next phase. The immune system is quite complex. Apart from defending us against microbes it appears to be quite important in healing. The formation of antibodies against damaged tissues seems to be quite routine and is probably part of the normal healing process. When those auto antibodies are made against proteins which are not limited to the damaged tissues you can get auto immune diseases in the aftermath of injury. Best documented is pemphigus, where the initial antibodies to skin proteins can be produced in response to damage by anything from UV radiation or thermal burns to surgery or drug adverse reactions. Sometimes the problem goes away with removal of the trigger or after healing of the injury, other times it's there for ever as a self perpetuating, on going, catastrophic problem with auto immune attack on the skin. Let's talk optic neuritis and multiple sclerosis. Optic neuritis is an inflammatory injury to the optic nerve. Usually it has no obvious cause (think gluten!) but occasionally it comes directly associated with sinusitis. The sinusitis does not have to be caused by acinetobacter, any infection will do, it can even be subclinical. Treatment, by aggressive surgical and medical management can produce prompt resolution of both the neuritis and sinusitis if a correct diagnosis is made (difficult if the sinus problem is subclinical and an MRI is not available!). The theory linking the two problems seems to be a localised inflammation, plus venous spread of a frightening soup of inflammatory mediators from the sinus past the optic nerve. The nerve is clearly injured, as reflected by the chunks of lost vision. The injury is not permanent if the sinusitis is successfully treated. The question to me is whether there is enough damage to the optic nerve for the myelin sheathes to be recognised by the immune system as needing antibody production, aka skin burns and auto antibodies to skin. If the damaged nerve does trigger antibody production you are set up with anti-myelin antibodies, which just might have you set up with an on going anti myelin syndrome, call it MS.
About half to three quarters of the people who get idiopathic optic neuritis go on to develop MS. The question to me is whether these are the half or more who had acinetobacter in their sinuses or those who developed auto antibodies to their myelin as a direct result of inflammatory mediator damage. I don't think there is information available which allows us to come to any conclusion about this. It is even possible that the initial priming of the immune system by direct nerve damage from sinusitis can be maintained and promoted by chronic acinetobacter respiratory infection or vice versa... A number of MS patients may be straight gluten toxicity mediated by the innate immune system in the absence of antibodies to anything. The idea (somewhat abstract) of antibodies to damaged nerves is interesting as it has similarities to immune mediated damage to nerves seen in the various experimental autoimmune encephalomyelitis models used to study MS. These are interesting in their own right and being injected with nerve tissue, especially from other species, appears to be a particularly potent way of generating "MS like" syndromes. They can be another post. Thanks to Stephan for getting me re started on this post. Hydrogen matters. I've been interested in diet and MS for some time. JK has apparently treated a small number of patients and Barry Groves has an interesting section on Second Opinions, mostly discussing a small series of 15 patients treated by Dr Lutz, plus a lady who put her MS in to remission by following the dietary advice in Eat Fat Get Thin. Lutz is very interesting and cautions against aggressive, sudden onset LC nutrition in this disease as there can be a severe flare. He also mentions this phenomenon in a number of (non MS) sections of Life Without Bread. Being a medic he has the facility to use corticosteroids under these circumstances and did so as needed. There is probably a whole post related to this idea, but I think it holds water. Anyway, MS appears to be manageable using diet. I'm going to try and look at some of the aspects as to why, though there seem to be several related ways of developing MS, which complicates matters. Intestinal dysbiosis and hydrogen production are probably crucial to development and offer some plausible mechanism for achieveing remission. As we all know, helicobacter gastritis is facilitated by hydrogen gas produced from carbohydrate fermentation in the colon (or the small intestine if you have adequate dysbiosis). Interestingly helicobacter appears quite happy to colonise both your respiratory system and the calculus on your teeth, presumably given enough hydrogen. The authors of the paper which looked at the role of hydrogen speculated that other infections, particularly of the respiratory tract, might also be facilitated by access to hydrogen. One other bacterium which appears to be extremely fond of hydrogen is acinetobacter. In its free living guise, just look where you can find it. All you have to do is to give some legumes the equivalent of intestinal dysbiosis by modifying their nitrogen fixing bacteria to "excrete" hydrogen, plant them in a field and there are the acinetobacter, eating it up. Acinetobacter bacteria are ubiquitous in soil, as commensals on skin/ mucous membranes and as pathogens. The pathogenic species love the respiratory system of critically ill patients and have an initial preference for the sinuses before generalising in to the lungs, blood stream and mortuary. "MS and chronic sinus infection were also significantly associated in the timing of attacks, in the age at which patients suffered their attacks, and in the seasonal pattern of attacks"
The p value for the association was p<0.0001, quite impressive provided you remember it's an association in a retrospective observational study, not an intervention trial. I am interested in Prof Ebringer's work on MS and acinetobacter. Prof Ebringer has a systematic technique for seeking out peptides in bacterial proteins which might reasonably be associated with auto immune diseases in humans. Obviously, for MS, you are looking for amino acid sequences in bacterial proteins which resemble a protein in myelin, the one which is targeted for attack by the immune system to give MS. Plus a few other neurological protein targets. Acinetobacter has such peptide sequences in several rather obscure sounding enzymes. The next question is whether patients with MS have elevated antibodies to acinetobacter bacteria. Yes, they do and they also have elevated antibody counts against synthetic peptides identical to those putative trigger sequences too. So where does that leave diet? I'm not a great enthusiast for using antibiotics for treating chronic recurrent sinusitis. Drugs are great for acute life threatening problems, or even for acute onset severe sinusitis. Guessing the correct one is part of my job. But bacteria like acinetobacter and its close relative pseudomonas (which shares similar myelin resembling peptides) simply laugh at the pharmaceutical industry's offerings. No, reducing the pathogenicity of these bacteria requires manipulation of their environment. As an aside on pseudomonas, I was a student in Camden Town just after the IRA bombed the Tower of London in 1974. The many burns patients from this particular episode (which made you quite uncomfortable walking past litter bins in central London) were successfully treated for potentially lethal pseudomonas infections using the vinegar and hair drier technique mentioned above, when all of the antibiotics available at the time were useless. This was cutting edge for our pharmacology lecturers and it certainly taught me something about bacteria. Back to acinetobacter and respiratory infection. I still get colds. So do my wife and son. LC friends do too. But the chronic persistent gunky nasal discharge, chronic sinusitis or persistent cough (for weeks or even months for some) that used to be a routine sequel to colds are a thing of the past. Respiratory bacteria live in an oxygen rich environment. Hydrogen, as noted by Stephan, Kwasniewski and NASA, is a very high energy molecule in the presence of oxygen. It can power a respiratory infection just as well as it can power an Apollo rocket. No hydrogen means no fuel. Acinetobacter live everywhere. Having them in your nose is common. We've probably always had them. Converting that balance to a chronic purulent sinus infection is arriving in the modern world. Getting rid of sinusitis strikes me as one route to removing the most likely trigger factors for MS. Marked reduction of hydrogen production from gut dysbiosis is probably essential to this. That means minimal fibre, minimal fructose, minimal gluten, minimal flatulence. Anything else we can do to normalise our immune function after that will probably help too. Well it looks like the doner kebab defamation is just a tiny part of a more concerted attack on saturated fat by the UK Food Standards Agency. After Chris ruined my morning by forwarding this link (thanks Chris! No, seriously, we need to know that stuff like this is happening...) I spent some time browsing the FSA web site. Ugh. "There are thought to be a substantial number of dietary factors, and factors related to the diet, which may modify the risk of colorectal cancer, e.g. diets rich in plant foods are thought to be protective. 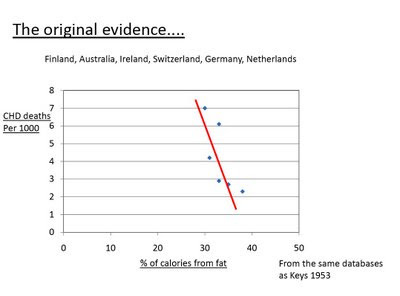 The mechanisms by which dietary factors can alter the risk, and a clear causal link between diet and the risk of colorectal cancer, are yet to be fully established"
The main up side is that even in the USA it looks to be possible, as Richard shows, to buy good quality food, though it might not be available in every location. I can see us going the same route. Food elitism for the educated. The rest eating what JK describes as slave food. I like Ray Mears, or to be more accurate, I enjoyed the TV series he and prof Gordon Hillman made for the Beeb back in 2007. This is probably the one set of programs, other than the Simpsons, that I've watched in the last five years. Their struggle to find, and then render edible, any sort of bulk carbohydrate in a temperate climate was amusing, especially when they offered the camera crew a taste of one of the less edible concoctions they had produced! The fish and the venison looked good. The camera crew are very important. Whenever I see advertising for a jungle survival documentary I always think first of the poor camera crews in deepest Borneo or wherever, lugging all their food around as well as their film gear. It must be hard filming someone living off the land while subsisting on baked beans, but then television is a hard calling. Happily Survivorman is self filmed, which limits the suffering of film crews. "The Survivorman show documents the (self-filmed) 7-day adventures of Les Stroud, who is dropped into various remote corners of the world to survive on little but ingenuity and will to live. Starting without food or water, the Survivorman scrapes and scrambles in the wilderness for essentials to survive in habitats as far ranging as the Ecuadorian rainforest to sub-arctic Labrador"
Looking at this sort of TV entertainment (which is probably very good TV, I'd probably enjoy it) as a lead to how humans ate before civilisation strikes me as a bit flawed. There are actually a few places on Earth which are fundamentally uninhabitable, but then no one lives in them. If there is food and an even remotely hospitable environment, we seem to have moved in there long ago, before eventually being wiped out by the forefathers of TV crews. But we weren't hungry, at least not for most of the time. Population size is controlled by food supply, humans live in tribes of between about 20 and 80 individuals and a tribe will have a territory of a size appropriate to support itself. The members of the tribe will be highly adept at obtaining adequate food supplies from that area. If this is impossible then the tribe would either be smaller or it would be somewhere else. Or dead. Everyone alive today comes from a very, very long line of successful hunter gatherers. The only reason we are here is because what our distant ancestors did was highly successful. Anyone who's great great great great (X100)th's grandmother died of starvation before having any children is not here today. We are the product of success. That is tribalism as it has always been. All tribal humans are fully equipped with absolutely everything they need in terms of utensils and knowledge to survive in reasonable comfort where they live. If the comfort is too great, humans will breed to use up the extra food supply. Tight times may be intermittent, but they function to reduce the population slightly and maintain the balance. Tribalism got us here and the phenomenon of a solitary struggle to survive in extreme conditions is a product of Civilisation. The struggle often comes from the ignorance of tribal survival knowledge. Even a group of 100 individuals do not make a tribe. Look what happens when you put over a hundred Royal Navy explorers on to the Arctic ice in 1845 without tribal knowledge or behaviour. Probably with complete disdain for the natives. This is the unsuccessful Arctic expedition of Sir John Franklin, when all 120+ men perished. The accounts are quite depressing but what is most interesting is that in this extreme, lethal environment where explorers (at the then cutting edge of British naval ability) were starving to death, over 100 native Eskimo were living. Living as they always had, men and women, making babies and looking after toddlers, routine tribal stuff. To the Inuit, fully educated in tribal life of the area, Franklin's expedition died of starvation in a food aisle of Sainsburys. A good speculative account, such as could be made out in the 1930s, comes from Stefansson's "Unsolved Mysteries of the Arctic", cheap on Amazon and far more detailed than anything on Wikepedia, though it lacks some of the modern forensic evidence. The follow-on from this is the complete lack of respect for the early explorers amongst the Inuit. The Inuit were there in the Arctic, which was an extreme environment to the Victorians, because there was enough food, shelter and warmth for them to live family lives there. It may not always have been comfortable, but it was successful. They certainly were not struggling to survive. A man alone with a camera is not where they were ever at. My favourite source of thought on human evolution is, as always, Daniel Quinn.